Delhi is much cleaner than it was in 2008. Have not even seen any cows yet (monkeys yes). People are as friendly as I remembered. Waiting for the 5 o’clock prayers to stop at Jama Masjid. Air is thick, feels like a sandstorm is approaching us. Prayers end, we walk in. The huge, orange sun sets, the rain begins. Tomorrow is an other day. This entry was posted in Uncategorized and tagged architecture, India, Islam, North India, religion on April 2, 2014 by Miia. If you are planning to travel from Bikaner to Jaisalmer by road, do not forget that it is a long way: 300km and many, many long hours sitting in the car. 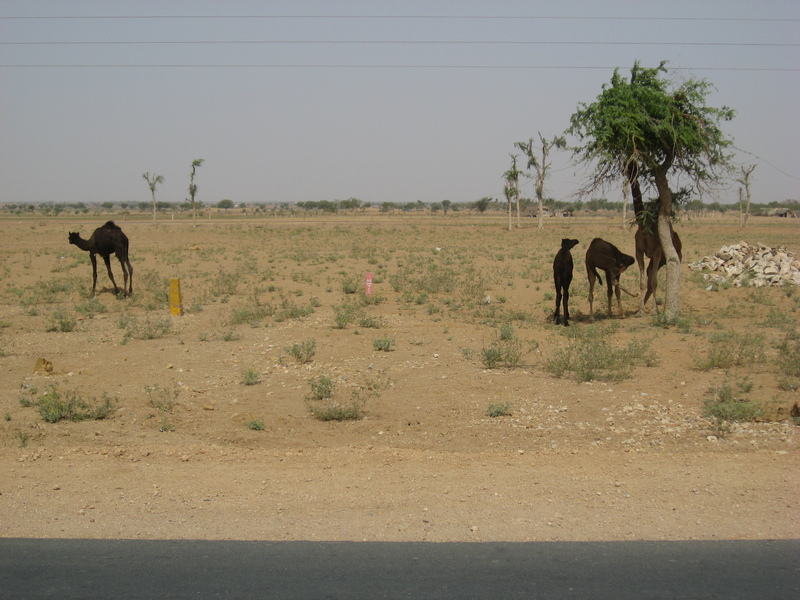 In addition, it will probably be rather hot –after all, it is the Thar Desert you will be crossing. India-Pakistan border will be less than 100km on your right side, parallel to the road. You will see more camels than people. This said, no worries, I have a solution for you and it is to organize a stop at Fort Pokaran like we did! Fort Pokaran is an enormous 14th century citadel, which is partially converted into a heritage hotel. Like many other luxury hotels everywhere in the world including Rajasthan, one cannot just walk in. The premises are reserved for paying guests (privacy comes with the package they pay for). However, based on our observations in Rajasthan (at least in most cases) hotels let you in against a small entrance fee and/or if you agree to spend at the restaurant. And this is exactly what we did with Fort Pokaran: we called them in advance and asked if it was ok that we came to use their pool for 2-3 hours, while promising also to eat lunch at their restaurant. They said yes, so we got to freshen ourselves up, swim in the lovely pool and eat an absolutely delicious lunch, and they got some extra clients. A win-win situation!! In the end of our lunch we got talking to the lovely owner, who proudly showed us around the premises. The rooms were elegantly decorated using local textiles and antique objects. Should we return to this part of Rajasthan, I would definitely arrange to sleep over at Fort Pokaran. 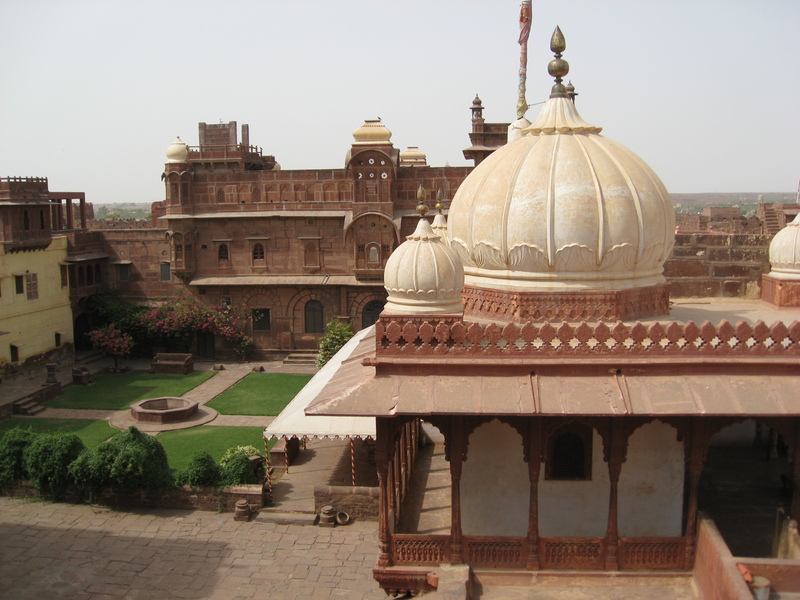 An other stunning, Mughal-style palace from the 14th century… a giant pearl in the midlde of the Thar desert! Part 5. 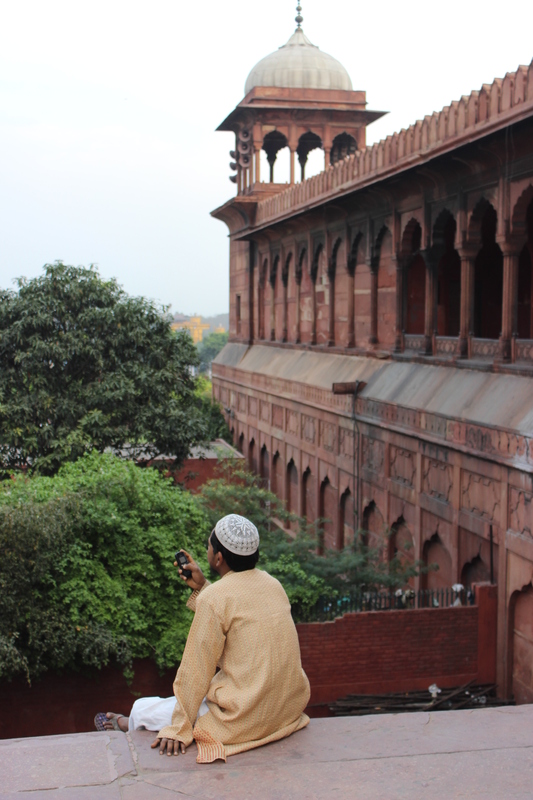 Fatehpur Sikri: what a pearl! PS Have you already joined Pearlspotting? This entry was posted in Uncategorized and tagged architecture, art, design & decoration, food, hotel, India, Islam, North India, Rajasthan, restaurant on March 21, 2014 by Miia. 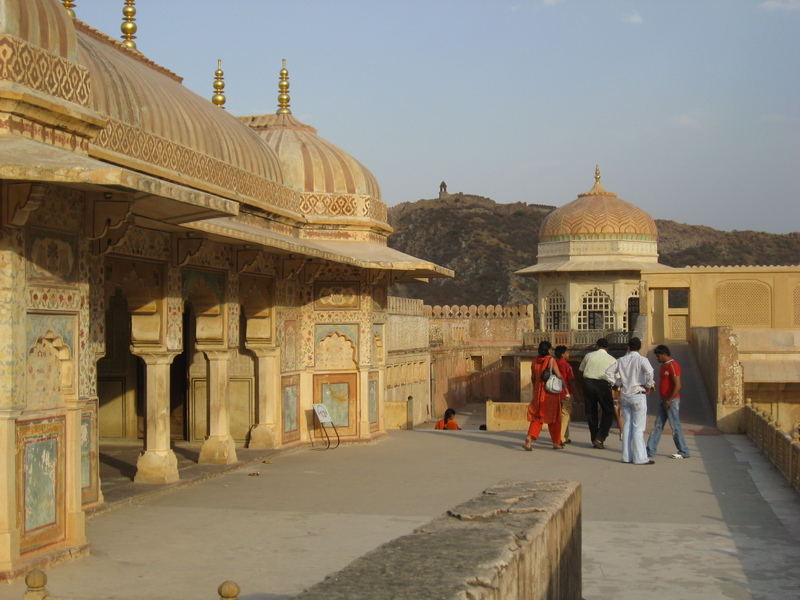 Amber Fort near Jaipur is another must thing to do while visiting Rajasthan. I know that I keep repeating myself, and I use many excessive adjectives, but this palace is a dream come true. It is spectacular. An architectural pearl and like no other palace. 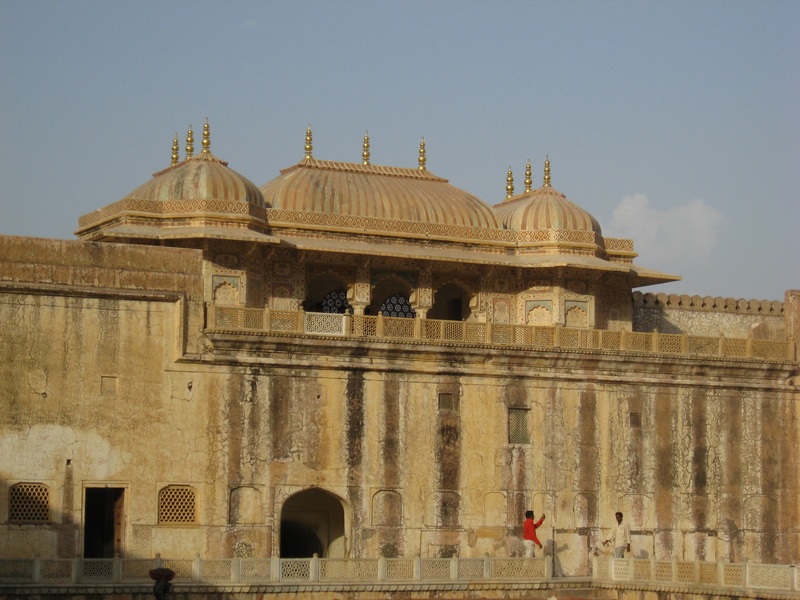 Amber Fort was built in the end of the 16th century on the ruins of an 11th century fort. Some parts were added a decade later. 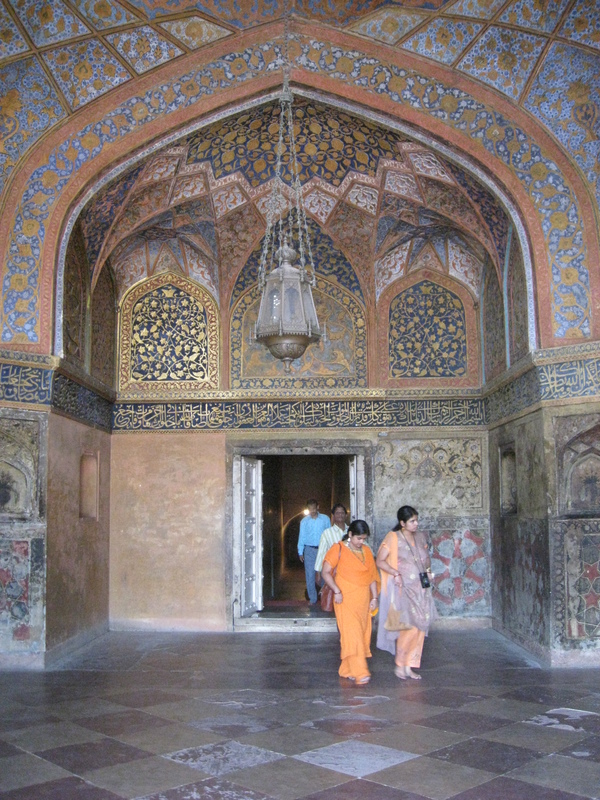 Style-wise it is a combination of Hindu and Mughal architecture, full of alluring ornaments, relief works, frescoes, carved doors and latticed windows. 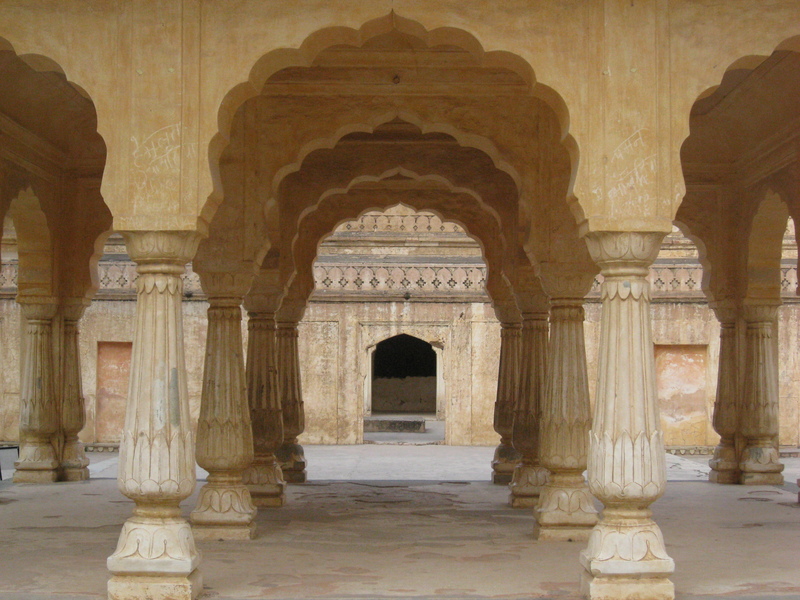 It seems that silver and marble were the favorite materials of Maharaja Man Singh, who ordered the construction of the citadel. We found Amber Fort rather calm. There were less people than in other touristic sites and they were mainly locals who were very friendly and curious. The security guards were very eager to practice English with us, and even gave us a private tour in one of the underground caves. What an adventure! It was definitely one of those moments when the rich history of India felt very vivid, allowing us to time travel to the era of Emperor Akbar. Some practical information: We left Neemrana Fort-Palace: the magnificent 15th century palace at 2 pm and it gave us plenty of time to arrive at Amber Fort by 4 pm. However, do check the opening times prior to your arrival! It took us about 2.5 hours to visit the citadel, and as you could notice from my photos, most of out time was devoted to taking pictures of and with local tourists. Indians LOVE to have a picture taken with you! If you are driving directly from Delhi to Jaipur, it is totally feasible to leave the capital in the morning and visit the fort in the afternoon. 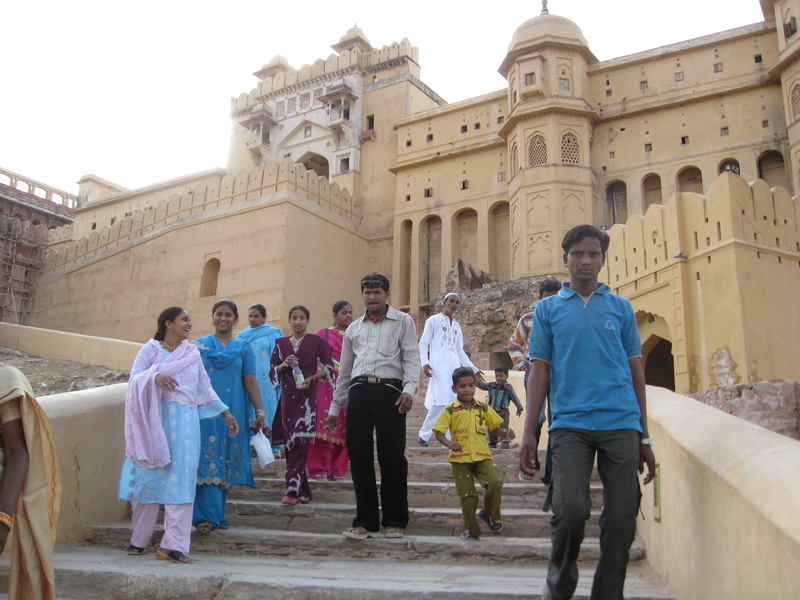 Alternatively, as many tourists do, make a morning or afternoon trip from Jaipur. After all, the distance is only 11 km and even a rickshaw can do this. This entry was posted in Uncategorized and tagged architecture, art, design & decoration, Hinduism, India, Islam, North India, Rajasthan, religion on March 12, 2014 by Miia. 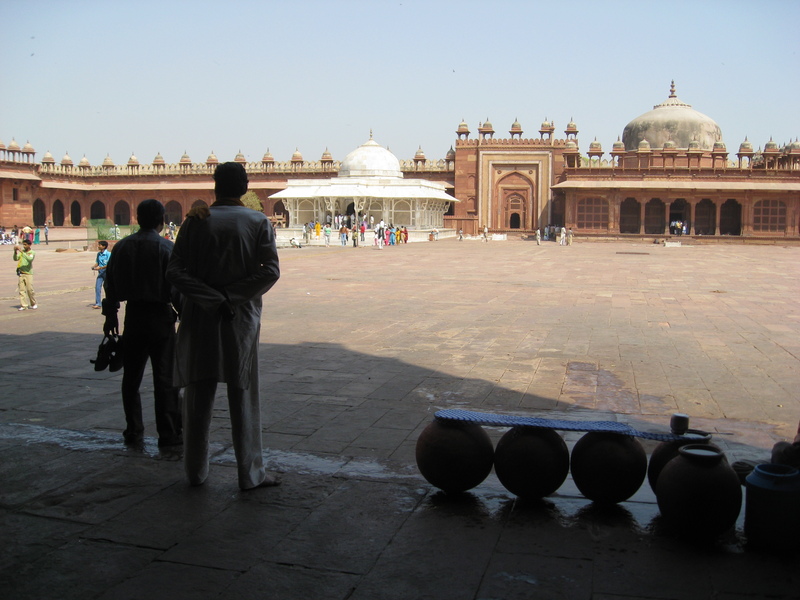 Fatehpur Sikri: what a pearl! 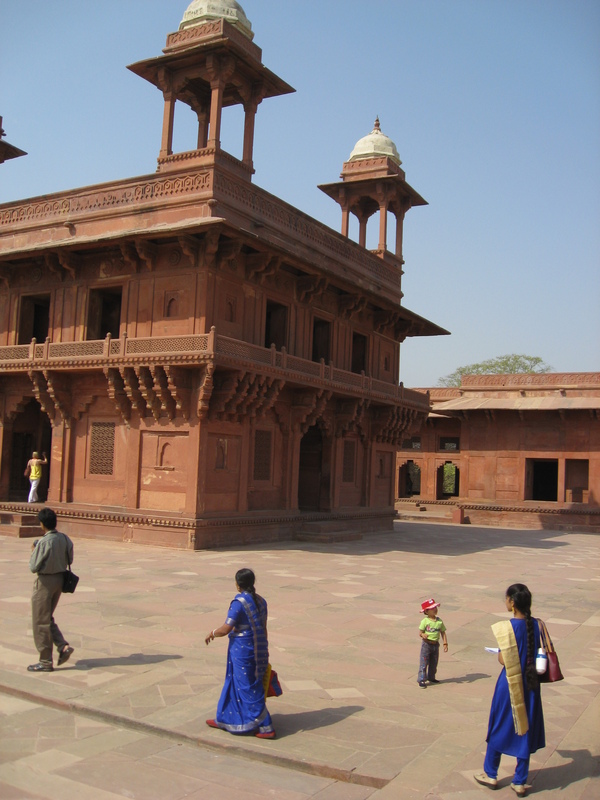 Fatehpur Sikri is located only 40 km from Agra and should be on everyone’s What To Visit list. Very different from the nearby Taj Mahal, Fatehpur Sikri is considered to be one of the finest examples of Mughal architecture. 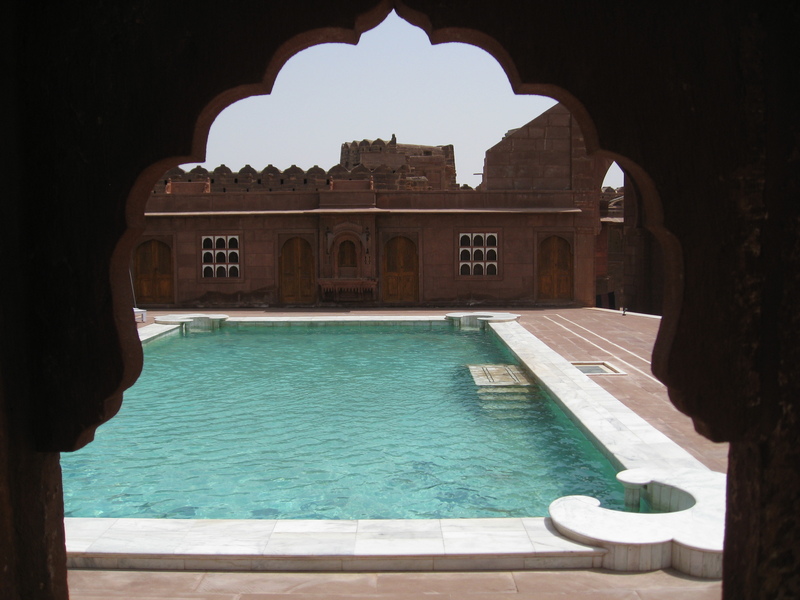 One more time, I repeat myself; do not miss this fantastic, abandoned red sandstone town! 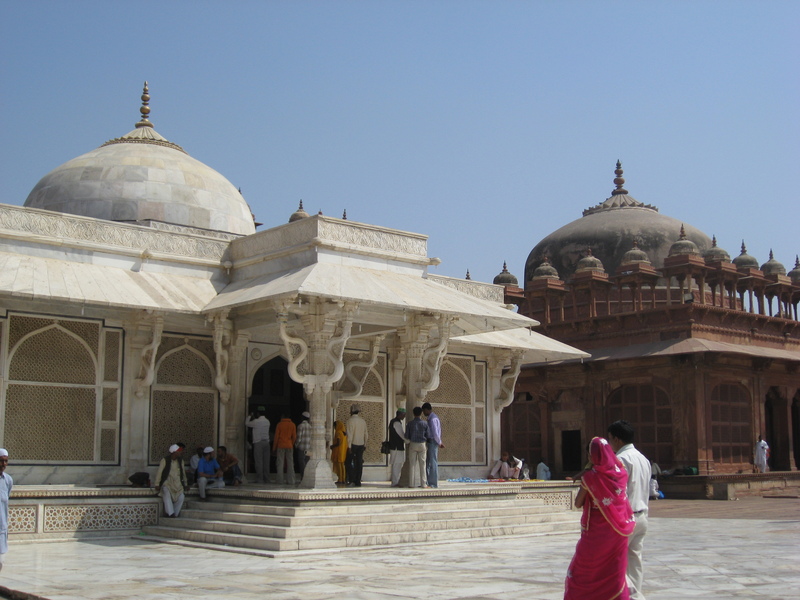 Fatehpur Sikri was constructed by the order of Emperor Akbar in honor of the famous Sufi saint called Salim Chishti who predicted the birth of Akbar’s son Jahangir. 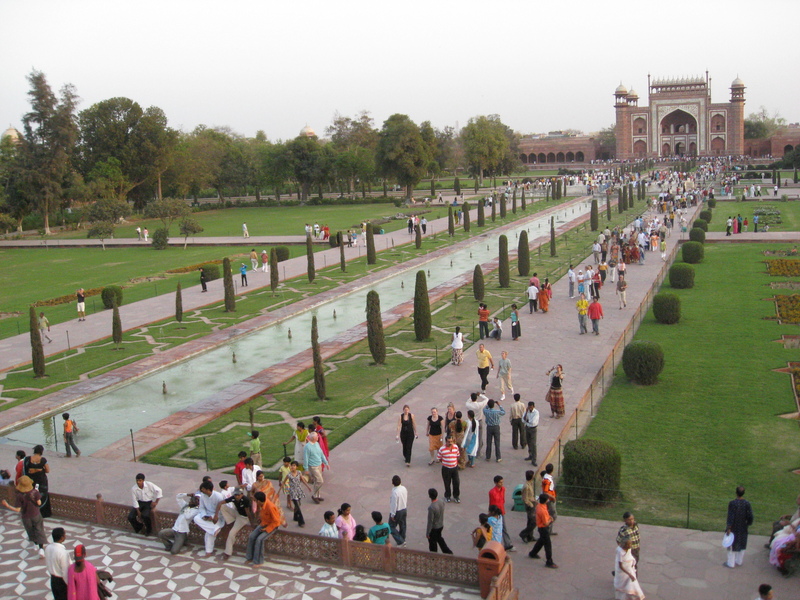 The capital was moved from Agra to Fatehpur Sikri in 1571 and remained there for 14 years, until Akbar decided to move the capital to Lahore to be closer to Persian and Afghan armies. There weren’t many tourists during our visit, which was nice for a change. We loved admiring public and private parts of the capital, the ornaments, pools, court yards etc. It felt like a phantom town: red, haunted and mysterious. But above all, exquisite in its beauty. We spent around 2.5 hours visiting the imperial complex, completing the tour at 11.30 am. Even this early, the heat was almost intolerable (this was in the end of March), so as a tip, think of bringing something for your head. A hat or a scarf can become handy, especially because women and men need to cover their head while visiting Jami Masjid mosque where the tomb of Sufi saint Chishti is. I would love to return to Fatehpur Sikri, and to me it is one of the most fascinating and beautiful sites to visit in India. I admit that I have a soft spot for the Mughal Empire period but I also think that Akbar was an extraordinary ruler whose presence can be felt in Fatehpur Sikri. 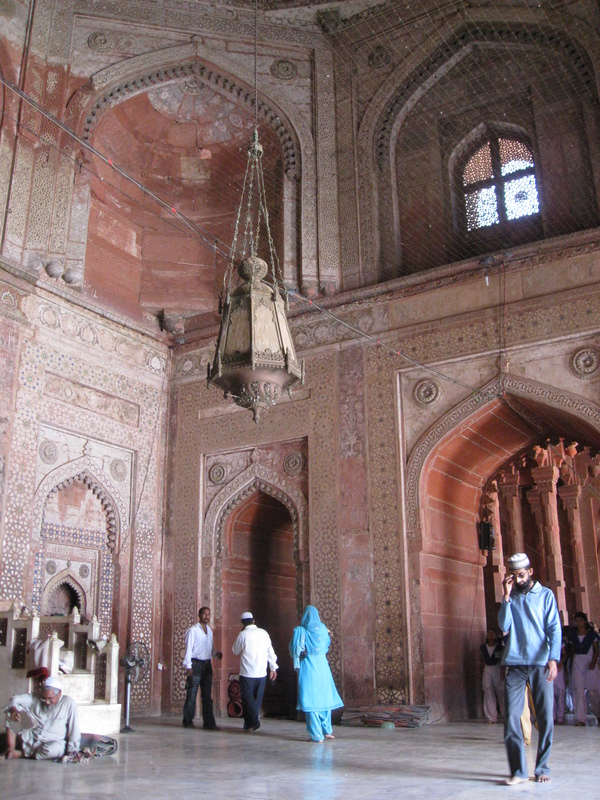 Do make time to visit it if you are in Agra! This entry was posted in Uncategorized and tagged architecture, art, Hinduism, India, Islam, North India, religion, Sufism on March 9, 2014 by Miia. 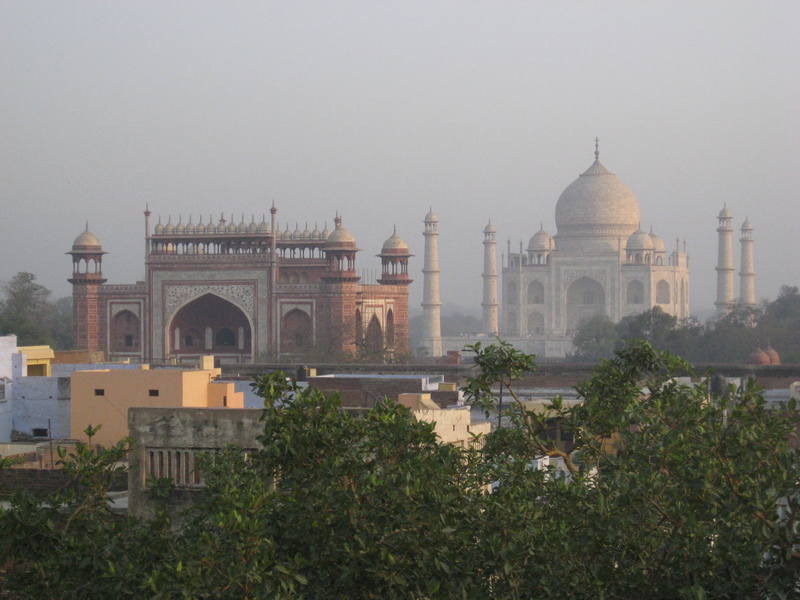 We left Delhi at 8 a.m. in the morning and arrived in Agra eight hours later (see Road from Delhi to Agra). The closer we got to Agra, the more our excitement grew. Taj Mahal, here we come! Will it be as stunning as everyone claims? And yes, I confirm, it was very impressive to see this enormous white marble mausoleum in the horizon for the first time. 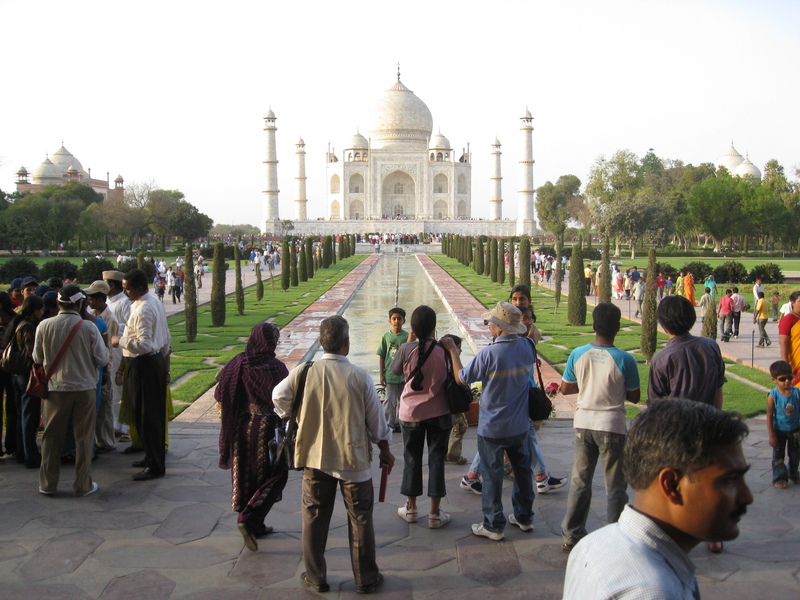 After dropping our bags at Hotel Kamal, we rushed to Taj Mahal, but the entrance procedure did not go as smoothly as it could have. Our bag contained illegal objects: guide books (!? ), a torch and cellular phones, and had to leave them at the entrance (check recent regulations at your hotel). After passing the security check, we arrived in the garden. Suddenly, there we were, with thousands of Indians, some tourists and cameras in every hand. Once in a lifetime experience. 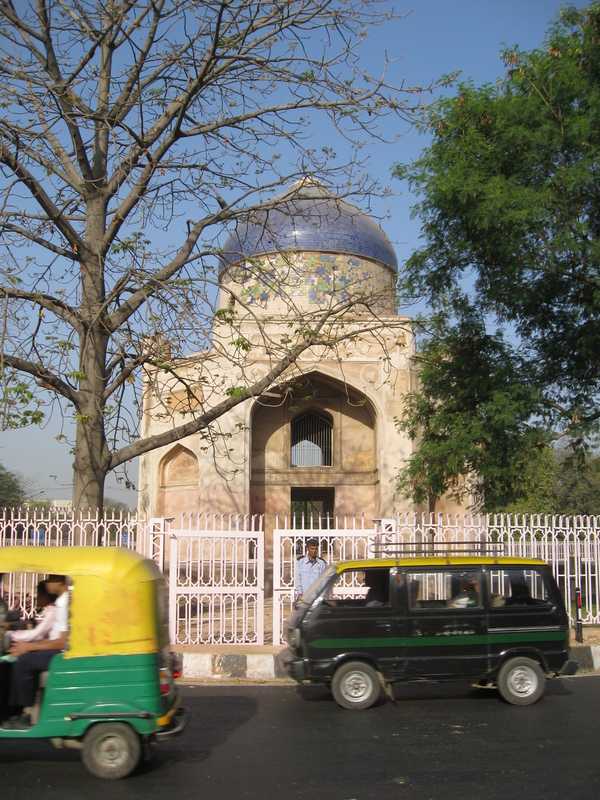 As Internet and guidebooks are full of information about this extraordinary 17th century mausoleum, influenced by Hinduism and Islam, I am not going to go into architecture and history (for example, Eyewitness India guidebook excels in architectural and historical descriptions). So, I will stick to sharing some more photos: Impressive, right? 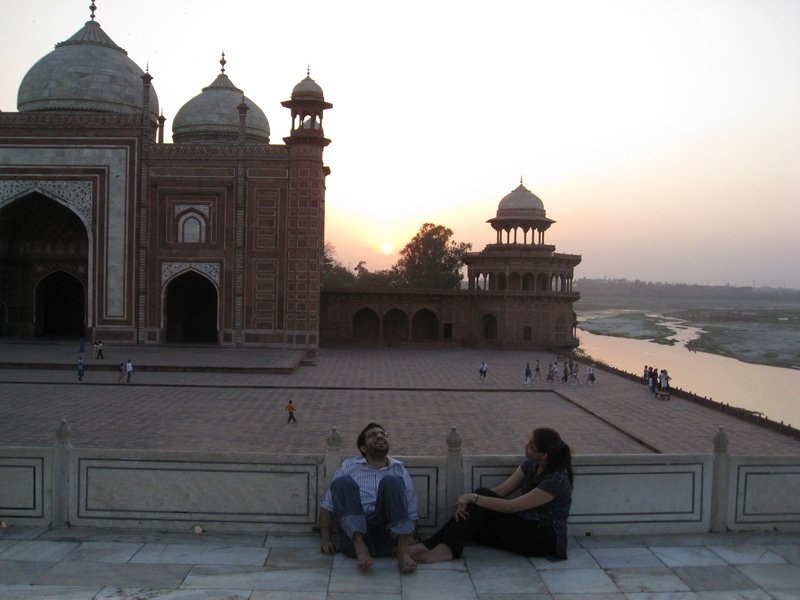 In our opinion, it was definitely worth arriving before 5 p.m. and wandering around Taj Mahal until the sunset. Highly recommended! Moreover, as you know, the sun is so strong in India that even for photo shoots the evenings are much better. Alternatively, you could also arrive very early in the morning. The next morning we woke up at the sunrise (5.30 a.m.) and climbed to the roof terrace of our hotel. 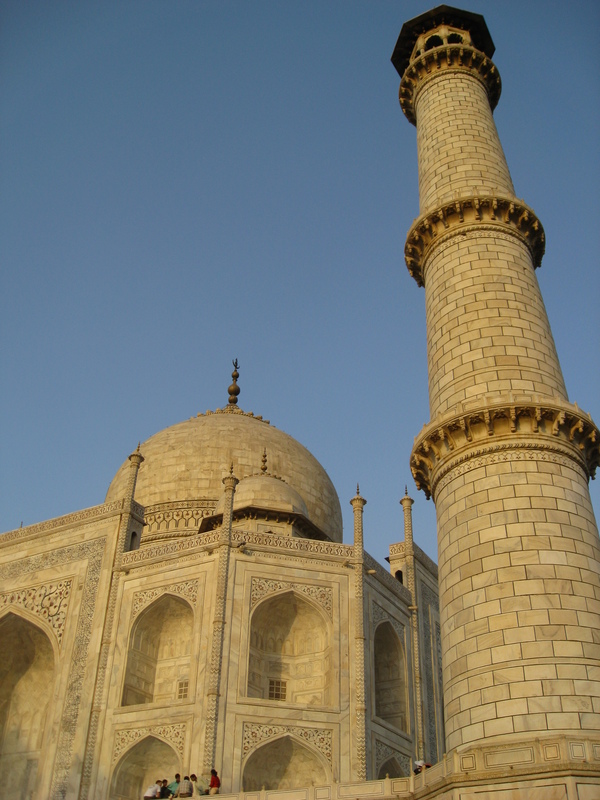 The famous appearance of Taj Mahal was worth the early wake. In fact, I would recommend either staying at a hotel that has a great view, or finding a roof top you can easily access in the morning. After the morning photo shoot we walked around the Taj Ganj quarter (in the immediate proximity of Taj Mahal), which left us a pleasant impression. 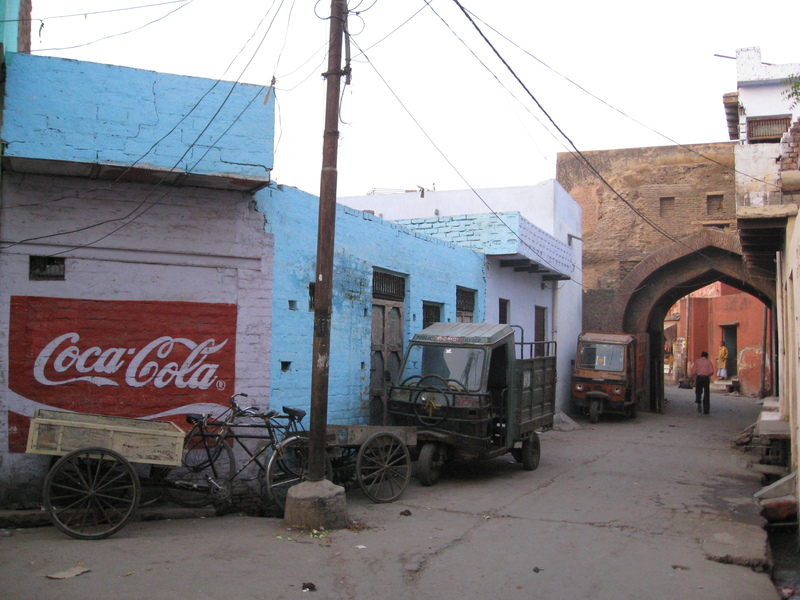 Quiet streets, old gates, rustic but charming houses, and friendly people. We had breakfast at the roof terrace of Shanti Lodge near our hotel and decided not to visit the Agra Fort and the Agra city center (that surely are worth visiting!). Next we picked up our bags and paid a rickshaw to take us to meet our driver who was waiting for us outside the center. 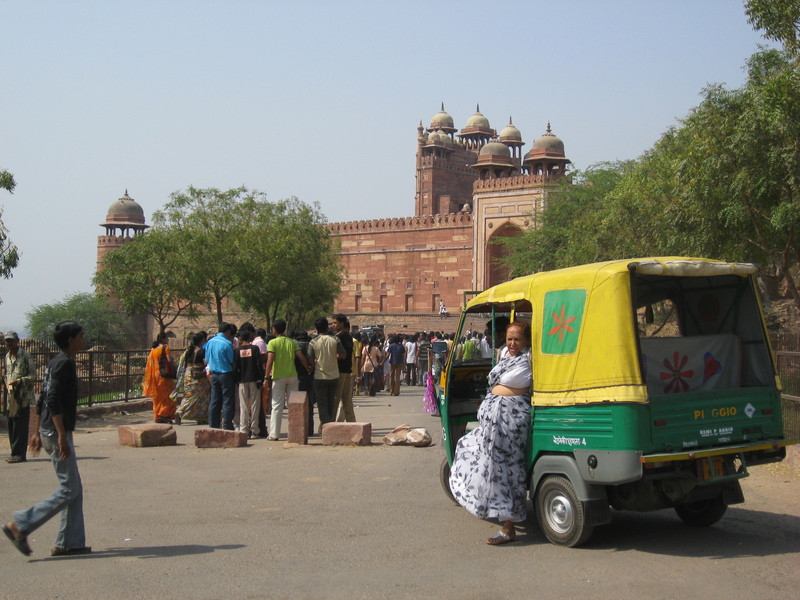 FYI: cars are not allowed too close to Taj Mahal, so your driver may ask you to take a rickshaw to reach your hotel. It was 8 a.m. and our day was only starting. Fatehpur Sikri, here we come! TAJ MAHAL TICKET AND ENTRANCE INFORMATION: To my understanding, tickets can be purchased until 5 p.m., allowing you to stay until the sunset. There are also night viewing tickets available around the full moon, but not on Fridays. However, please note this information is based on our travel memories from March 2008 and on Internet reading, so please check the latest information with your hotel prior to arrival in order to avoid disappointments! HOTEL KAMAL (http://www.hotelkamal.com/): The hotel was very simple, but we had big windows and hot water. Its location and roof top were big bonuses. However, my quick Tripadvisor browsing shows that recent reviews are not that great. It seems they redid the hotel since our visit and unfortunately there are no prices available on the hotel’s website. So, all I can say is that we were pleased with our stay, but we paid 400 INR ( 4.7€ or 6.5USD). A real bargain!! EATING IN AGRA: We did not eat particularly well, so cannot recommend anything. Lastly, have you already joined Pearlspotting? This entry was posted in Uncategorized and tagged architecture, art, design & decoration, Hinduism, hotel, India, Islam, North India on March 8, 2014 by Miia. 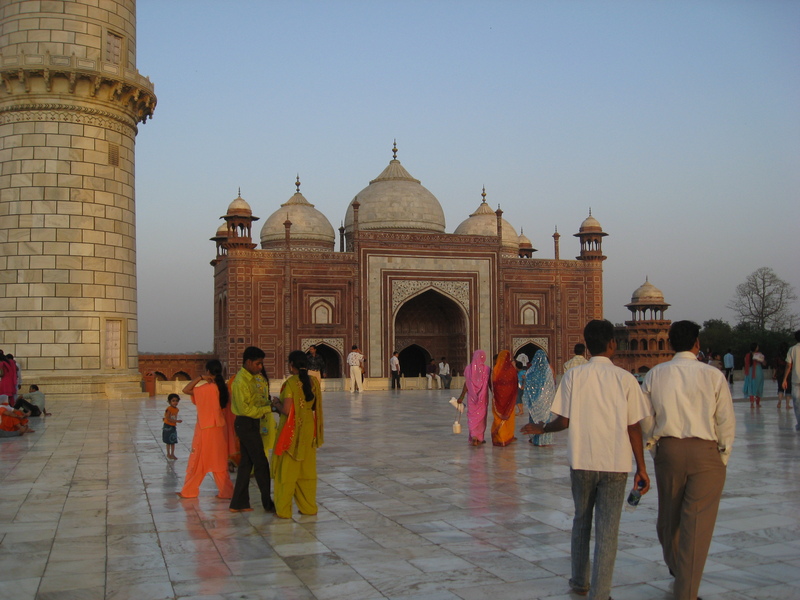 To travel from Delhi to Agra by car, train or plane, that is the question of many visitors heading to see Taj Mahal! The distance between Delhi and Agra is just over 230 km, but driving along the old National Highway can easily take 5 hours. When we drove to Agra in 2008 it took us eight hours with some stops… And this is with a driver who knows the road! However, thanks to the recently built Yamuna Expressway the travel time is close to three hours now. Definitely worth the toll. We met our driver in front of our hotel and begun the journey at the dawn. Navigating out of Delhi was not as painful as I had expected, and we soon found ourselves surrounded by agricultural and industrial countryside, colorfully dressed people and some interesting monuments. Our first stop on the route was Mathura. This lively, religious small town used to be Buddhist until Hinduism took over in the 8th century. Today, it is known among devoted Hindus as the birthplace of Krishna. Precisely, it is in the temple of Sri Krishna Janmabhoomi were he was born, it is said. No cameras were allowed inside. 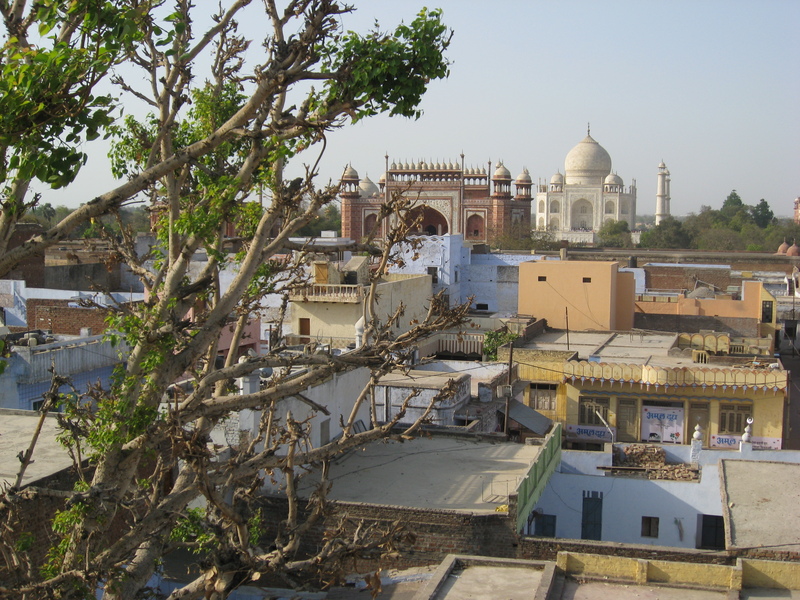 From Mathura we moved to Sikandra, where the Mughal Emperor Akbar the Great is buried (1555-1605). 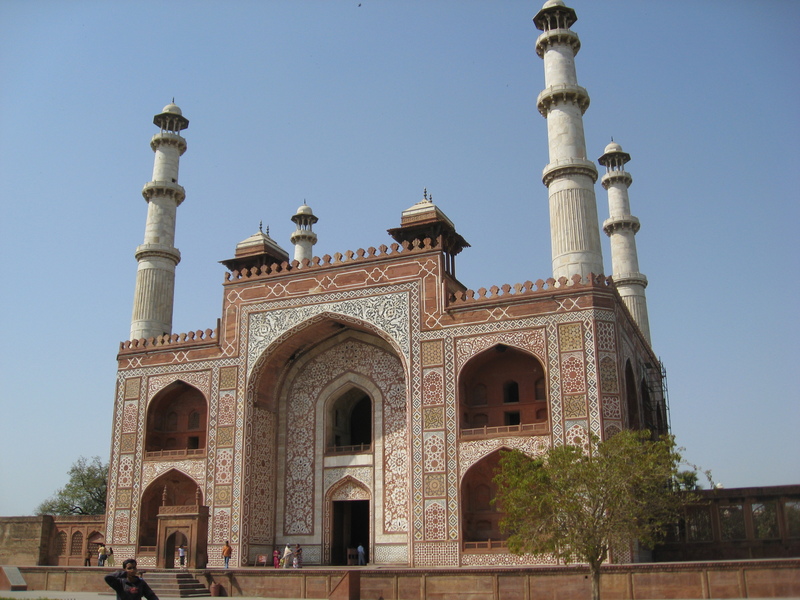 His mausoleum is a 17th century architectural masterpiece, which Akbar according to a Tartary belief started constructing during his lifetime. It is said to be a forerunner of Taj Mahal and I found it very beautiful. Whatever you decide, buy some water and enjoy the ride! This entry was posted in Uncategorized and tagged architecture, art, Buddhism, design & decoration, Hinduism, India, Islam, North India, religion on March 7, 2014 by Miia.